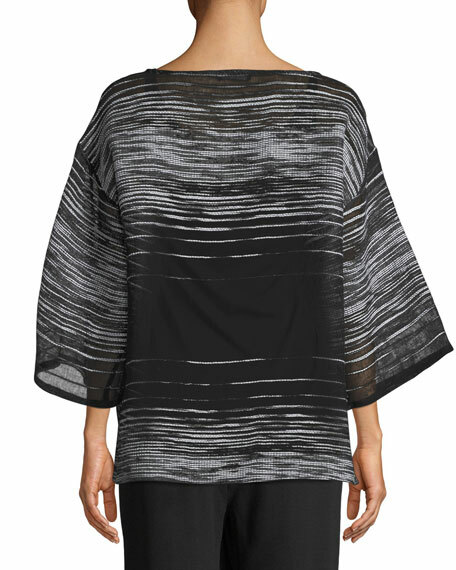 Eileen Fisher airy illusion mesh top. Eileen Fisher tunic in stretch terry. Round neckline. Long sleeves. Front patch pocket. Pullover style. Relaxed fit. Tencel® lyocell/spandex. Hand wash. Made in USA of imported material. Model's measurements: Height 5'11"/180cm, bust 32"/81cm, waist 25"/64cm, hips 36"/91cm, dress size US 2/4. Eileen Fisher sleek, easy knit top. Approx. 29"L down center back. Scrunched mock turtleneck. Long sleeves. Relaxed silhouette. Shirttail hem. 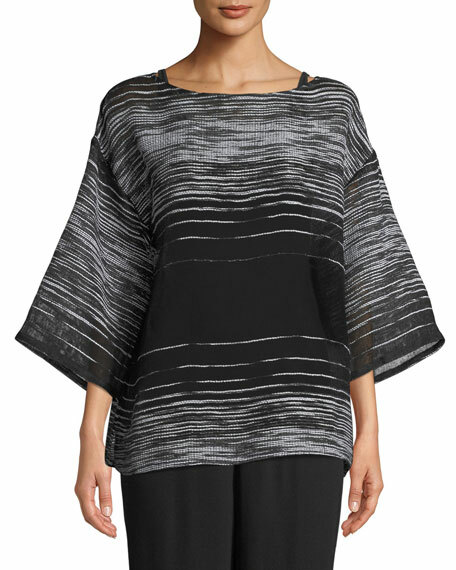 Eileen Fisher sleek, easy knit top. Approx. 29"L down center back. Scrunched mock turtleneck. Long sleeves. Relaxed silhouette. Shirttail hem. Slipover style. Tencel® lyocell/merino wool. Hand wash. Imported. Model's measurements: Height 5'10"/177cm, bust 33"/84cm, waist 25.6"/65.2cm, hips 35.8"/91cm, dress size US 2-4/FR 34-36.